Computer backup is the storing copies of your files on a medium other than your hard disk. The reason that we make computer backups is to protect against the event that something happens to damage our files so they are no longer usable. If we have backups of our files, then we can restore these files to our computer through our backups. What is Involved in Computer Backup? Computer backups can be made in very different formats. The traditional method of backing up computer files was the floppy disk. However, floppy disks are becoming increasingly obsolete. It is already not uncommon to not even see a new computer that includes a floppy disk drive when you go to the computer store, and it is becoming almost impossible to actually get a new computer that includes such a drive. Floppy disks can only hold 1.4 megabytes of data, and there are formats which can hold much more. CD-Rs are CD-ROMs that you can actually write onto, and hold up to 800 megabytes of storage. You can also use CD-RWs, which can be written onto more than once, unlike a CD-R. DVD burners are also becoming increasingly common, and a typical DVD-R can hold up to 4700 megabytes, or 4.7 gigabytes. Another new technology which is becoming common for computer backup is the key drive. These are removable drives which are very small, the size of a key chain, and many in fact are designed to operate as key chains. They can hold up to gigabytes worth of data, not as much as a typical DVD-R but still a sizeable amount of data. 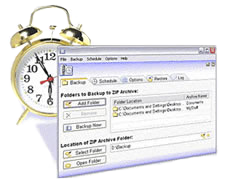 You can also make backups of your files online. Online backup involves putting your computer files onto an online server, which you can access from any computer that is connected to the internet. This allows you to not have to bother with physical media such as key drives or CD-ROMs while still backing up your data in a secure location. What is the Best Form of Computer Backup For Me? Only you can decide which form of computer backup is best for you. CD-Rs and DVD-Rs both hold a lot of data, but they have the drawback of only being usable once. Even CD-RWs and DVD-RWs, which can be rewritten, are not as manipulable as the old floppy disks. Although you can rewrite the CD or DVD, you must still complete the rewrite all at once. You cannot simply take a file from the CD-RW, modify it then re-save it onto the CD-RW, you must rewrite all of the data on the entire disk. This can be a great drawback to using them for your storage use. A key drive does not have such limitations. While they are not as large as a DVD-ROM, they are still sizable, and you can work on them just as you would any drive on your computer. This makes them very powerful for your computer backup needs.